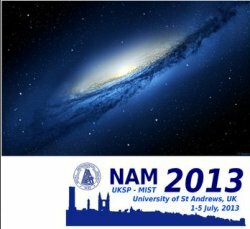 The Liverpool Telescope will be holding a session at this year's U.K. National Astronomy Meeting which is to be held in St Andrews, Scotland. Two 75 minute sessions are currently scheduled for the afternoon of Monday, 1st July. The goal of these sessions is to discuss recent results from the LT, developments in instrumentation at the telescope, and current plans for a successor to LT, the LT2. The meeting may also be used by those wishing to present talks or posters on Time Domain astronomy, large-scale monitoring projects, or observations of transients. The deadline for submission of abstracts is 1st April. Please refer to the NAM website for further details, a full schedule of events over the five days of the meeting, and information on travel to and accommodation in St Andrews.